This article first appeared in the Stratford Herald and is reproduced verbatim with their permission. 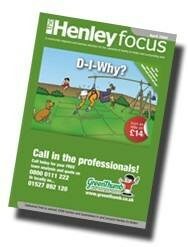 The Editor of Henley NEWS Online had no influence over this article. "SORRY seems to be the hardest word"—little did Elton John know when he penned those lyrics how conveniently they would sum up a parish council's ongoing row with a now infamous 'purple shop'. 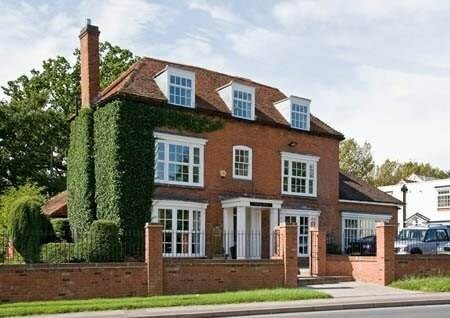 A special meeting of Beaudesert and Henley Joint Parish Council was called on Thursday evening to discuss the media coverage of the parish council's activities, in particular those surrounding Bespoke Curtains and Blinds of Henley and its controversial purple exterior. More than 30 residents turned out to the meeting despite the parish council neglecting to advertise the agenda anywhere and yet again there was a sense of 'Groundhog Day' for anyone who attended looking for the council to apologise for its actions. Instead, the council seemed keen to pass the blame on to the media, alleging it had portrayed the council in a bad light despite numerous comments from residents and even the proprietors of the curtain shop that the newspaper reports have been accurate. There was still no apology despite the rather severe allegations being levelled at certain members of the council. Cllr Carsina Goodman has been accused of racism. This follows her comments to the curtain shop's proprietors including "this is my town and you're not welcome here" and "if you don't like it clear off". Two complaints have been made against her to the Standards and Ethics Committee at Stratford District Council. Meanwhile, Warwick and Leamington MP James Plaskitt has declared his dismay at the parish council's behaviour. Council chairman Cllr Les Goodman, who is also Cllr Mrs Goodman's husband, announced that a letter had been sent to the proprietors of the curtain shop to ask them to meet with the council at their convenience to discuss the way forward and the council was waiting for a reply. However, as he made this announcement, the proprietors of the curtain shop were sat with the assembled residents. Proprietor Zak Miah even stood up later on in the meeting and apologised to the council and the community for the trouble he had caused and extended the hand of friendship to the council. Still the council made no direct comment to the proprietors. Councillors would obviously prefer to wait for a reply to their letter. In reference to –James Plaskitt's comments, Cllr Goodman appeared to question their authenticity by saying the council had received no comment from the MP themselves. Several months after the saga began, residents were still keen to air their views in the public participation session. In summary, Peter Crathorne, chairman of the Town Improvement Committee, called for councillors to set aside their personal differences and openly and calmly work for the best interests of the town. One resident asked councillors if they were prepared to apologise to the town. She continued that if they were not their position was untenable because they had lost the confidence of the town. Former High Bailiff of Henley, Douglas Bridgewater, commented this was not MI 5, it was the lowest form of local government and it should be transparent. This comes after the council voted at the last meeting to continue a discussion on the purple shop in private session despite over 30 residents gathering expressly to hear what councillors had to say. Another resident questioned whether there was more to the curtain shop events than he knew as it seemed to just be an opportunity to have a go at the council by other groups. The e-mails received from Henley News On-line, edited by Cllr Bill Leech, encouraging residents to come to the council meetings were described as playground bullying by one resident. She said it was like going round shouting "fight, fight, fight". "Humility carries more weight," was the comment from yet another resident. He continued that by not apologising the council was making a rod for its own back. Next it was the council's turn. Cllr Goodman said the last meeting had gone into private session because one councillor had failed to disclose a prejudicial interest which would have been material to any discussion. The councillor in question had been at a meeting with the curtain shop that day and had not disclosed it. However, this does not match up with what residents witnessed at the meeting of 1st February. It was Cllr Roger Hubbocks who proposed further discussion on the purple shop be moved into private session as he felt the council had not had a chance to discuss it properly. At Thursday's meeting Cllr Hubbocks, said the media had really gone to town on the parish council but all they had done was work within the procedures they had guidelines for. Cllr George Matheou said the media was there to bring tourists to the town and anything else was immaterial. Cllr Nick Haycock said he was delighted the curtain shop was there but planning rules had to be adhered to. The last word was given, to Cllr Mrs Goodman. She said: "You have got to want to do this job. I want to do it and I will continue to do it." Henley NEWS Online is most grateful to the Editor of The Stratford Herald, Chris Towner, for allowing us to reproduce this report. The whole matter should have been resolved at the the council meeting on Feb 1st - Mr. Miah the proprietor of the shop has agreed to change the colour; all the council needs to do is to supply him with a list of Conservation colours. During the public participation at the special meeting on Thursday 11th Feb Mr. Miah apologized profusely saying he was so sorry for all the trouble the shop frontage had caused which gave the JCP a perfect opportunity to apologies for their miss handling of the matter. The JCP chairman over emphasized the point that they do a lot for the community, which was repeated laboriously by various councilors - this isn't in dispute and wasn't on the agenda. A matter which could have been amicably agreed was left to fester thus exacerbating the ill feeling, by failing to take the opportunity to settle an issue which has already been exaggerated out of proportion many residents have lost confidence in the JPC. I am astonished at the latest developments particularly the threat to you. It is quite unbelievable. Who do these people think they are….if they disagree with you then they have their own forum to air that. Making personal threats to you is not the way to do it. It’s clear a lot of the residents of Henley are with you in your quest for more accountability and transparency by the Parish Council. They seem to have lost sight of the fact that they are meant to be ‘our’ representatives and not there to run the town as their own personal fiefdom. Sadly this attitude is one that permeates politics at all levels now in my view. I was not aware we had lost the right to free speech in this country – yet…………..keep up the good work on behalf of the people of Henley Bill. We appreciate all you do, even if we may not always agree with you, perhaps there is a lesson in there for our ‘representatives’ on the parish council! How long before there is an election….we must lose our apathy and vote in the next one or we will be stuck with what we deserve. HNOL is a most valuable community resource and we thank you for your efforts in setting it up and maintaining it. The councils own website is hopeless, even the agenda/minutes sections are usually out of date. The Rotary Club of Henley-in-Arden along with most other Rotary Clubs in the UK, immediately responded by donating money for Rotary Shelter Boxes to be flown to Haiti. ShelterBox Response Team (SRT) member Jane Nash has just returned from Port au Prince. She says the importance of getting people into tents cannot be underestimated.‘The rains are going to be really hard and it is going to take a long time to get transitional housing up and running. Our tents will withstand heavy rain. Would you want to be in a tarpaulin sheet in a torrential downpour when the ground will be soaked? The look on one woman’s face when I gave her a tent was like it was the best thing she had ever had, ’said Jane. ShelterBox General Manager Lasse Petersen, who has also just returned from Port au Prince, added: ‘At present the vast majority of people left homeless have yet to receive even plastic sheeting. These families need immediate emergency shelter rather than becoming caught up in policy debates. So far, more than 7,000 ShelterBoxes and disaster relief tents have been distributed in Haiti and another 1,200 are due to arrive in Port au Prince, Haiti’s capital, by Friday. 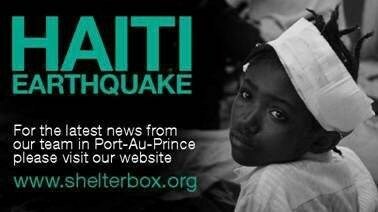 The SRT in Port au Prince already has a planned distribution in place for these boxes. 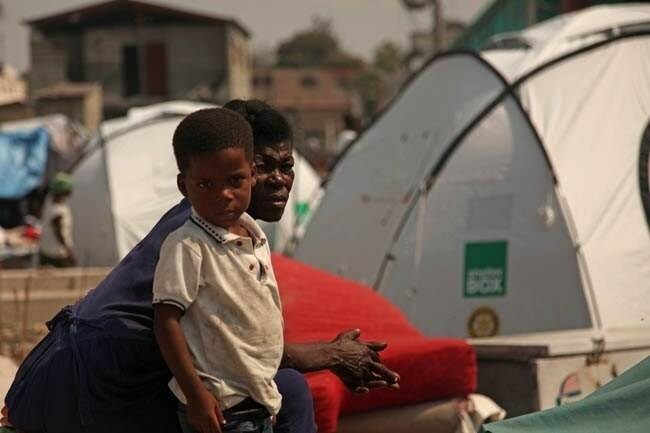 ShelterBox has committed another 5,000 tents to Haiti, which will provide shelter for another 50,000 people. These will start arriving at the end of February. ShelterBox tents undergo rigorous testing and will be able to stand up to the spring rains which will soon descend on Haiti. On Tuesday 16 February, SRT members Mike Greenslade (AU) and Dave Ray (UK), who are in Port au Prince, worked closely with community leaders and the Red Falcon, US 82nd Airborne to distribute 180 ShelterBoxes. Mike said: ‘We could not have achieved a safe distribution without the 82nd Airbourne. The soldiers of Red Falcon ensured that boxes went to the most needy in the camp. I like the new "cost effective and timeless video" on the TOWN WEBSITE. By comparison with the JPC video, it doesn't have the "on camera speeches" which can cause embarrassment at a later date, i.e. when people die, leave office and are replaced, come into disrepute etc,. For example, why do we we have a "former" county councillor speaking. Nearly all the speechmakers on the JPC video are aged over 70. 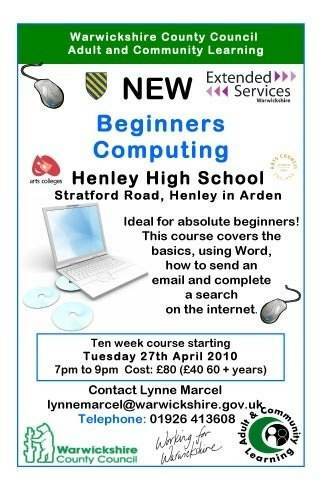 Where are the young people of Henley? Why do certain shops on the JPC video seem to get special advertising (i.e. studio 34)? Will the JPC video have to be updated every time new JPC and Court Leet officers are elected? Why could the JPC not produce a video that would be useful for many years to come? As usual, the JPC have not thought it through......yet another example of their "Telephone kiosk" thinking and action!!!!!! The Environment Agency is inviting Henley-in-Arden residents to join them at the Guildhall, Henley-in-Arden, on Saturday morning (27 February 2010) to find out more about flood risk and what they can do to prepare. People are welcome to drop in at any time between 10.30am and 1.30pm. Environment Agency staff will be available to give information and advice and to help people to prepare an individual flood plan. The event has been organised in partnership with Henley-in-Arden Parish Council and the National Flood Forum, who will be demonstrating flood prevention equipment. 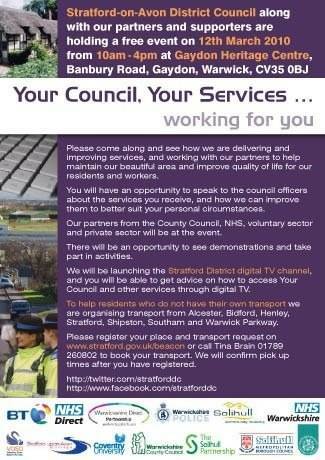 Warwickshire County Council and Stratford upon Avon District Council will also be sending representatives to the event. basic strategies for protecting property, preventing business disruption and promoting recovery. Flood Incident Management Team Leader Sue McCarthy says “The 2007 floods in Henley-in-Arden proved the devastating impact that floods can have on people. The emotional cost can often far outweigh any financial costs involved – but there is a lot that homeowners can do now to prepare. For example, simple measures such as preparing a flood plan can make it much easier to deal with when it happens. Councillors have unanimously set the district element of the council tax in the Stratford-on-Avon District, at a full meeting of the Council today, Monday 22 February, following new proposals by the Leader of the District Council, Cllr Les Topham, to reduce the proposed 2.5% increase to a 1.5% increase, one of the lowest in Warwickshire. The average Band D figure for Stratford-on-Avon District Council households for the 2010/11 financial year will be £129.34, an increase of under 4p a week. This means that all the services provided by the District Council are only costing £2.49 per week for a Band D household. The JPC costs a further £1.63 per week for a Band D household. SDC also collects amounts for the County Council and the Police. District & Parish Council Tax - Band 'F' Household. Note that this is not the total council tax you will pay, there are other items to be added to this figure. 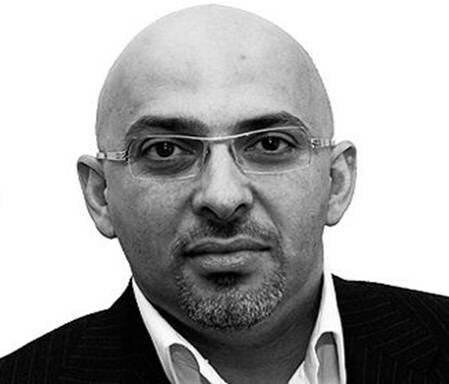 Henley Ward Members wasted no time in organising an opportunity for Henley and Wootton Wawen residents to meet Mr Zahawi at Tanworth-in-Arden Village Hall on Tuesday 23rd February. When VAT was temporarily reduced to 15% the Chancellor added 2% duty to fuel to offset the reduction in tax collected from motorists. 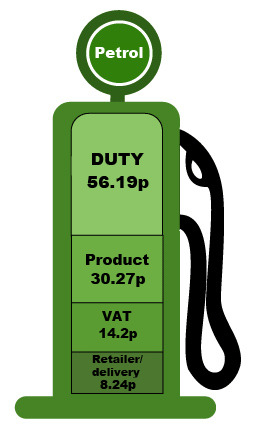 Now that VAT has been increased to 17.5% again this hidden tax has not been removed - hence recent rises in your fuel costs. Sign the petition at the link below to have this stealth tax removed! I am writing from your local Air Ambulance to ask your Parish to support a forthcoming event to help keep our helicopter flying to our local villages. As we do not receive any Government or National Lottery funding, the £1.5m annual operating cost relies entirely on voluntary donations and events such as this. 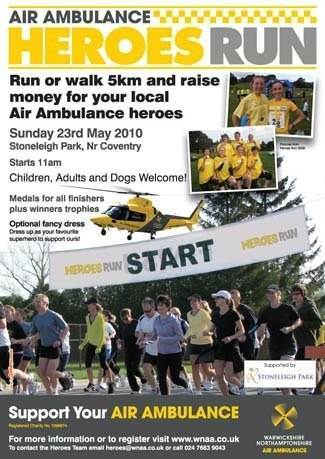 Warwickshire & Northamptonshire Air Ambulance (WNAA) is hosting its flagship 'Air Ambulance Heroes Run' at Stoneleigh Park, Nr Coventry, on Sunday 23rd May. This event is taking place to raise funds to keep the helicopter and crew flying and to celebrate the life saving work of the doctors and paramedics who are real life heroes to many people. You can run or walk the 5km course and bring your whole family along if you like as both adults and children can enter. 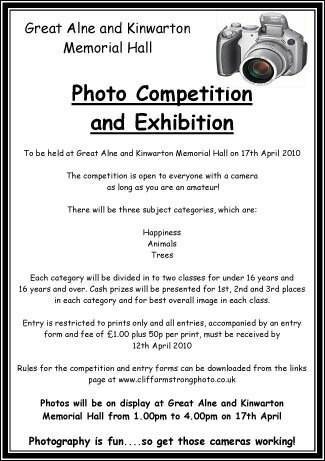 Entry is £10 for those aged 16 and over and £5 for under 16s. By getting sponsored for taking part WNAA can raise even more money. It will start at 11am and there will be medals for all finishers plus trophies for the winners. There is also OPTIONAL fancy dress where you can dress up as your favourite hero, be it Superman, a popstar or one of the WNAA doctors who may have saved your life! Subject to missions the helicopter and crew will be on site to meet people. On-line entry is at: www.wnaa.co.uk/Heroes_Run.html. Parish Clerks in Warwickshire have been asked to rally support for your local life savers, as we are running an ‘INTER-PARISH COMPETITION’. 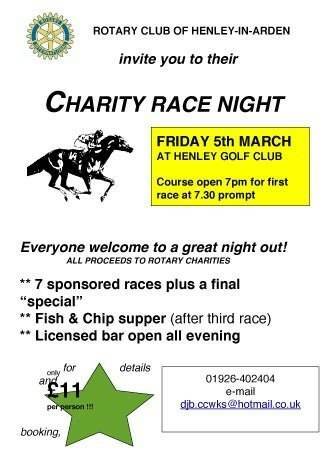 The winning parish will be the one that raises the most funds for taking part from entry fees and sponsorship, and will receive a visit to the WNAA base (up to 5 people) to meet the helicopter and crew! To be part of this, when completing entry forms, Parish members should write the name of the Parish in the address section. Thank you for your support and we hope to welcome you all to a fantastic day of fundraising. 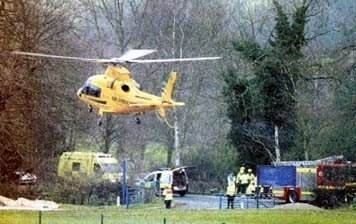 The Air Ambulance regularly visits Henley. Johnsons have offered to supply a coach free of charge, in return for all passengers making a small donation which will be passed to WNAA. The pick up will be at the Nags Head at about 10 am. They will also provide their tour booking system for reservations, on a first come first served basis. 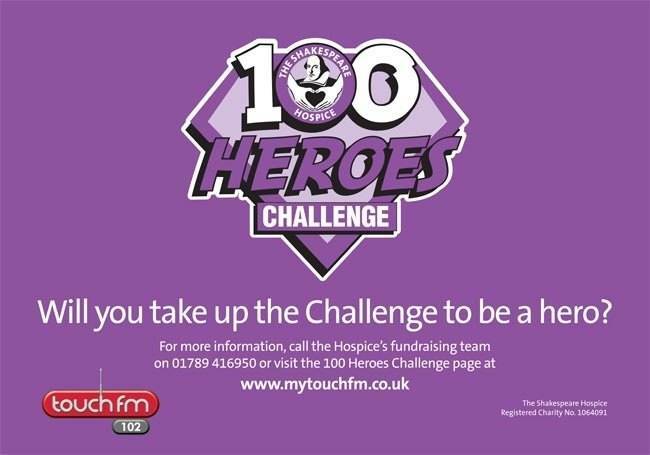 Passengers should call 01564 797000 to book and pledge their transport donation. Last year was Johnson’s centenary year and they raised over £16,000 for WNAA during the year from a series of excellent events, which was enough to support 16 life saving missions. 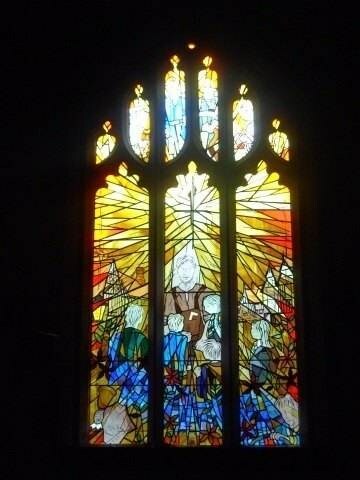 The Churches Of Henley Welcome You This Easter. 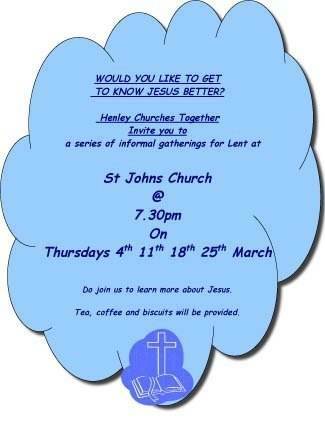 The Churches in Henley will be combining for a series of meetings on Thursdays 4th 11th 18th & 25th at 7.30pm hosted by St John’s with refreshments. They will be considering the topic WOULD YOU LIKE TO GET TO KNOW JESUS BETTER?. Come and join us for a stimulating and informative evening on all or any one of these dates. SPECIAL APPEAL FOR WATER DURING LENT. This year it will be for CORD (Christian Outreach Relief and Development), a charity based in Leamington Spa. St John’s congregation are supporting a water scheme for a village in Burundi, bringing much needed clean drinking water and so preventing disease and unnecessary death and hours spent everyday fetching water, especially by children who then miss school. Anyone in the town wishing to contribute to this appeal can put their donation in an envelope marked CORD Lent Appeal and deliver to the Rectory or put through the door at 142/144 High Street. 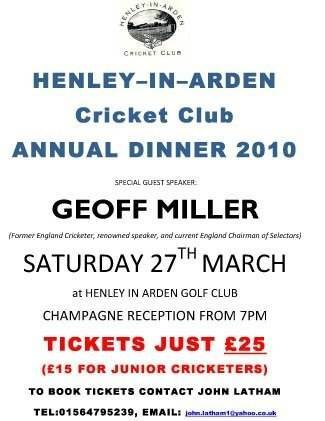 (Cheques payable to Henley-in-Arden PCC Group Please mark envelope Cord Appeal). West Highland Way – Paul Kershaw and Robin Rumbles are planning to walk the 96 mile West Highland way at Easter in aid of this year’s CORD Lent Appeal. Sponsorship forms at back of church. Further information from Robin on 794424. Sunday Services all at 10.30 am are: 7th – Mr John Parkes 14th – Revd Robert J Powell (Sacrament) 21st – Mr. Michael Sergeant 28th – Revd Caroline Homan. The Baby and Toddler Group meet every Monday morning from 10.30 am. Maunday Thursday 4 pm Communion. Good Friday UNITED SERVICE Market Cross 10 am. UNITED SERVICE at Baptist Church at 10.30. Easter Sunday . 10.30 am service. Maunday Thursday. 8-9 pm Communion. 9-10 pm Vigil. Good Friday. UNITED SERVICE Market Cross Service. 10 am UNITED SERVICE at Baptist Church at 10.30. Easter Eve Saturday. Lighting of Easter Candle and short service. 8 pm. UNITED SERVICE 10.30 at Baptist Church. Service of the Passion St Nicholas Henley 3.pm. Maundy Thursday. Service in Baptist Hall with Communion 7.30 pm. UNITED SERVICE at Market Cross at 10 am. UNITED SERVICE for all Churches. 10.30. Easter day. Service on The Mount 8am. Weather permitting! Good Friday: 7pm. Reflection on the Crucifixion. Easter Day: 9am Holy Communion. All are invited to the Alpha Course which will be hosted by Henley-in-Arden Baptist Church. It will meet on Tuesday afternoons at 2 p.m.-3:30 from March 9-May 11. This is a nondenominational DVD class on basic Christian beliefs. The only cost is £2 for the course manual. For more information, call Carroll or Jim Fox at 01564 794 098. The Henley Fairtrade Group is taking part in the national Fairtrade Fortnight campaign which this year has the theme of “The Big Swap” encouraging people to swap their usual brands of groceries etc for Fairtrade ones in order to benefit small producers in developing countries. Top of the things to swap this year is tea. The next time you make yourself a cup of tea, spare a thought for all the people who are responsible for your cuppa. There are the farmers and workers, many of whom work for long hours doing physically demanding work for low pay. Then there are the merchants, traders, importers, buyers, blenders, transporters and retailers…all taking their share along the way. If you are a small scale producer you have little power to negotiate a fair price in the face of the gigantic international tea trade, mass producers and price variations in the global market. Tea is big business: over 1 billion ups of tea are drunk every day worldwide, 165 million in the UK. Because the UK is the third largest importer the UK’s biggest tea brands are being urged to “Make it Fair” and go Fairtrade. Over 20 million people in the developing world rely on the tea industry; producers today receive only half of what they did 30 years ago so they are staking their livelihoods on people like us swapping to Fairtrade tea. Currently only 10% of tea sold in the UK is Fairtrade; if you drink Fairtrade tea every day you can make a real difference to the lives of tea workers, their families and communities….. so, please get swapping in Henley! 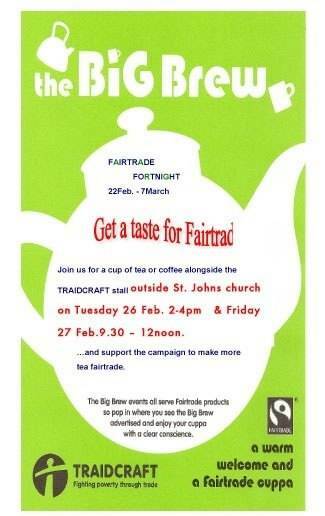 To encourage you we invite you to come and taste a cup of Fairtrade tea or coffee outside St John’s on Thursday 25th Feb from 2-4pm or Friday 26 Feb 9.30-12noon. We’ll have some Fairtrade goodies there as well on the Traidcraft stall. The purpose is to highlight the issues faced by tea producers in the developing world. There is even less excuse not to try a Fairtrade product this year because we now have, in the Cooperative/Somerfield, a store which is committed to Fairtrade products...even converting some of its own brands to Fairtrade, which will be on display in the store. Cilla Pudney - Henley Fairtrade Group. 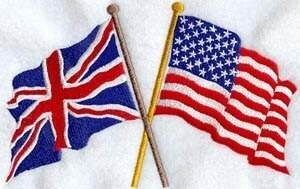 Our new English acquaintances here ask us how we’re “settling in”. We are settling into English village life just fine. 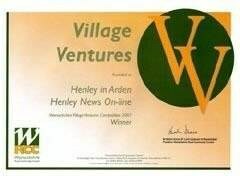 We think of Henley as a village (4,000 people) but we can’t use that word to locals who would be offended since it achieved market town status by the 1200s, when the king gave the town a charter. There’s still the stone cross dating from then on High St. This ancient market exists even now. On Wednesdays, farmers bring chickens, pheasants, and rabbits (both dead and alive) to auction as well as eggs, produce, meat and flea market items to sell. Nearby is an interesting, tiny village (wide spot in the road) – Wootton Wawen. It was five times as big as Birmingham (20 miles north) when the Doomsday Book was compiled in the 11th century. The Doomsday Book was a census ordered by the Norman conquerors so they could tax the local Anglo-Saxons. We had our first guests for dinner on Friday night in our tiny living room (no dining area in our little house)—we invited them for a New Mexico style dinner. They warned us that they didn’t like spicy food, so we served avocado dip and tortilla chips, chicken enchiladas, tacos, pinto beans and rice without any hot peppers. They seemed to enjoy it—a definite change from their typical British roasted meat, potatoes, parsnips, carrots, and rutabagas. Cultural Observations about Small Town Life in England. 1. Towns and villages seem neat, tidy and well kept. We rarely see trash in the streets or houses in disrepair. 2. Farms and pastureland surrounds the towns. We see sheep grazing within less than a mile from Henley. High well-trimmed hedges instead of fences border each farm. 3. People usually walk rather than drive in town. Henley is only one mile long. We see many elderly people out with their trolleys (a combination of a walker and shopping cart) doing their errands. Rain doesn’t slow anyone down including moms (mums) wheeling baby strollers draped with water proof plastic. A big reason for walking must be the high cost of gas ($9 a gallon) as well as the lack of parking. These towns were built ten centuries ago—who foresaw a need for parking? People say they retired here in Henley because of its convenience. All the necessities are within walking distance—doctor, dentist, a pharmacy, banks, small grocery stores, etc. plus it is a low-crime area. 4. Public transportation is excellent. Henley has both bus and train lines with a stop here every hour on the Birmingham (20 miles north) and Stratford upon Avon (8 miles south) routes. UK citizens over 60 get free public transportation to cities within 20 miles or so. And they use it. Every coffee morning we meet seniors from both Stratford and Birmingham who get off at Henley for our church coffee time and perhaps the outdoor market! In closing, we wanted to share some new British vocabulary to illustrate our common language that sometimes divides British and Americans. A publican is a pub operator. To nick or pinch means to steal. A misery is a complaining person. A diary is an appointment calendar (Everyone carries a diary!). A decorator is a house painter. To hoover means to vacuum. Mean or “tight as a tick” refers to someone who is stingy. A mutton dressed in lamb’s clothing refers to an older woman who dresses like a much younger lady. 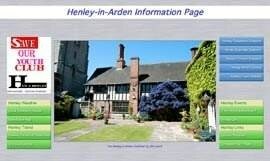 Jim and Carroll Fox are here in Henley supporting the ministry of the Baptist Church and we wish them an enjoyable stay. 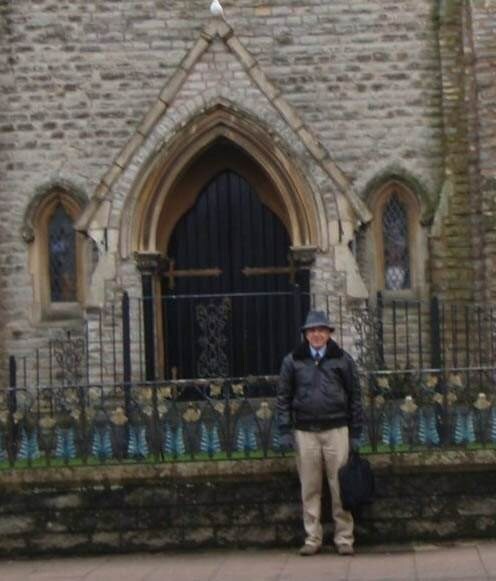 Our photo shows Jim outside the Baptist Church. A company based in Henley-in-Arden has won contracts for interior building work in over fifteen schools and nurseries in the Midlands area. 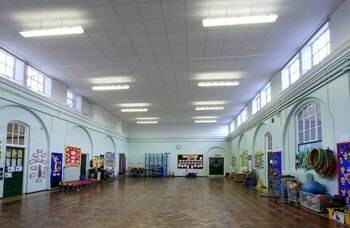 Fairway Interiors Ltd has been helping to ensure that the interiors of school halls, classrooms and other learning areas meet high standards of acoustic quality. Fairway Interiors have used their skills in installing ceilings, wall linings, flooring and other internal elements with the result that all the children in these schools now benefit from improved sensory environments and are able to take in information and communicate with teachers and classmates more effectively. Striking the right balance between reverberation time, background noise and sound insulation is important in any space where people have to communicate. Good acoustics increase speech intelligibility and have a strong, positive impact on the quality of training and the learning ability of participants. The company always uses products supplied by highly reputable and knowledgeable manufacturers. Julie Naquib, Deputy Head Teacher at Sladefield Infant School says: - “The installation work by Fairway Interiors from the initial survey to completion was exemplary. The improved sound quality has had a marked positive effect on all those using the hall, especially those with hearing impairments. Parents, governors and visitors have commented on the calm, relaxed atmosphere during our assemblies, performances and workshops and there has been a reduction in our heating bill”. Fairway Interiors can refurbish or fit out any commercial or educational environment including offices, factories, hospitals, sports centres, reception areas, banks and retail space. Fairway Interiors was founded by brothers John and Matthew Farmer, in 1992. A family business which has grown and developed over the years, it has established a reputation for quality and trust and is one of the leading Midlands-based companies, working throughout the UK on commercial interior fit-outs and refurbishment. Taking responsibility for the complete project, from design and project management through to high quality installation and finish, ensures that all clients enjoy ‘value for money’ projects which are delivered on time. In the education sector, Fairway Interiors offers evening, weekend and school holiday services to fit in with school calendars to reduce the impact on pupils. In the commercial sector, Fairway Interiors can work in occupied buildings with a schedule that will minimize disruption to the working day. "Can I have some Irish Sausages, please?" asked the Irishman, walking up to the counter. "If I had asked you for Italian sausage, would you ask me if I was Italian?" demanded the Irishman indignantly. "Or, if I asked for German Bratwurst, would you ask me if I was German?" Then, warming to his theme, he went on: "Or if I asked you for a Kosher hot dog, would you ask me if I was Jewish?" "Or, if I asked you for a taco, would you ask me if I was Mexican? Would Ya? Would Ya?" The assistant said: "Well, no." Suitably encouraged by the success of his logic, and pleased to strike a blow against the Irish stereotype, the Irishman stepped it up a gear. "And if I asked you for frogs' legs, would you ask me if I was French?" "Well no, I probably wouldn't" conceded the assistant. So, now bursting with righteous indignation, the Irishman said: "Well, all right then, why did you ask me if I'm Irish just because I asked for Irish sausages?" The assistant replied: "Because you're in Halfords......"
Business travel – another waste of tax-payers’ money? Sir Nicholas Winterton MP said last week that all MPs should be allowed to travel First Class on trains (as indeed they currently are). He added “Those in Standard Class are a totally different type of people.” And of course the media have seized upon this rather pompous assertion. He’s right of course. Those on Standard Class are indeed different: they paid for their own tickets, those in First Class didn’t. This got me thinking back to when I used to travel First Class on the train – my, that was a long time ago. It is indeed much easier to get some work done in First Class. That’s why I used to do it – well, that and the lovely full English breakfast served at your seat: a much better way to pass the journey than actually working! 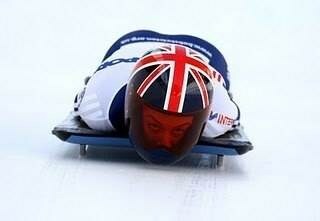 I used to try and work on the way back - though I often fell asleep. First Class was good for that too. It was perfectly normal then; once you had reached a certain job grade your employer allowed you to travel First Class on the train (and often Business Class on an aeroplane). Nowadays it’s different. Companies just can’t afford it and their employees are encouraged to seek the cheapest fare wherever they go. This doesn’t seem to apply to civil servants though. I don’t know why it’s necessary for so many civil servants to commute on a regular basis but I can’t believe they are paying the fare difference themselves. I wonder who is……..
First Class open return: £240 (no deals). You can get cheaper fares for advance purchase but there is still £100 difference between Standard and First Class. Presumably Virgin Trains can fill their First Class carriages or they’d have to reduce the price; perhaps they’re filling them with civil servants and MPs. With the current need to drastically reduce public spending perhaps the Government could make some savings here. Make Henley Greener recently assisted the Heritage Centre to identify and install low energy forms for nearly all of its lighting. To do this a list of the number and type of every lamp and electrical appliance in the building was compiled into a large table (computer spreadsheet). When combined with the hours of use this enabled a prediction of the annual electricity use and costs. The result was very close to the actual figures on bills. This showed we had a good understanding of the centre’s electricity use and that lighting accounted for over 80% of daytime electricity. We then contacted various companies to try and find suitable low energy bulbs. Samples were obtained and evaluated before decisions were made on what was the best replacement. The new information was put into the spreadsheet, enabling the effect of changing the lamps to be calculated. The predicted savings are about £460 per year plus an annual reduction of 2.1 tons of CO2. The total cost of all the new lamps was about £470 which means the average payback time is just over a year. From then on, it’s savings all the way! This was an interesting exercise since the majority of its lamps are spotlights. The most common were GU10 and R64 (see pictures below). The low energy versions of these cost about £5.70 and £4.50 each respectively which seems a lot of money for a light bulb. However, the graph below shows that it is not the price of the bulb that matters but the cost of the electricity it uses. 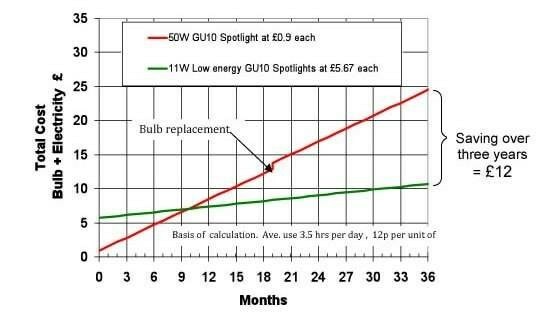 For an 11 watt GU10 (light equivalent to 50 watts), it takes about 10 months for the savings in electricity to pay for the higher cost of the bulb; after that the savings build quickly with the added convenience of not having to replace the bulb for about 6 years. Over the life of the bulb, savings amount to about £36. For the cheaper R64, the payback is quicker and they have a expected life of 8 years. If, as in the case of the Heritage Centre, there are many of these spotlights it is easy to see how large savings can be achieved. Replacing the R64 presented no problems at all and they were very satisfactory with a good quality of light. With the GU10s there were some snags to solve. As you can see below the 11W GU10 is longer than the original. This meant that it would not go in some fittings. The solution was to use 7W GU10s equivalent to 35W. The reduced brightness was assessed and found acceptable and the payback time and savings even better than using the 11W. Like all low energy CFL lamps they take a minute to get to full brightness which means that they might not be suitable in places which are used for only a few minutes at a time. Another little problem was that the slightly fatter shoulder of the low energy GU10 fouled the shroud on some fittings. This was solved by taking down the fitting and shortening the shroud by a few millimetres. So, before committing to buying a full set of GU10s, get just one and check the fit. Hatton Electrical in Avenue Farm Industrial Estate, Stratford (01789 415005) allowed us to have bulbs on approval, so we were not committed to buying them if they were unsatisfactory in any way. The most spectacular savings were achieved on the floodlights in the stairwell. Here a total power of 525 watts was reduced to 48 watts and even at £6.85 per bulb, they paid for themselves in under 3 months. The special low energy floodlight bulbs were equivalent to 150 Watts each but the reduction in brightness was checked and found acceptable, especially after cleaning the glass on the front of the housing!!. The bulbs contain a reflector to maximise delivered light. In addition to the above there are low energy R50 and R80 spotlights and also candle bulbs and golf balls. An important thing to check when you buy low energy bulbs for use in the home is that they are described as warm white or colour temperature = 2700K. 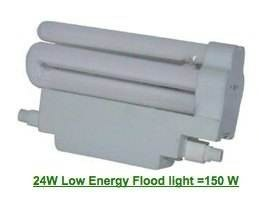 Cool white or daylight or colour temperatures of 4000 or 6000k will give a colder looking light. This is OK if you want that effect but the colour of 2700K is similar to ordinary high energy filament lamps. Watching wildlife in your garden is such a treat but not all wildlife is welcome, warns Stratford-on-Avon District Council. We all enjoy seeing a variety of different birds in our gardens and many of us will be encouraging them by putting food out for them. But Stratford District Council is warning that some residents are taking it too far and serving up a banquet which is also attracting less welcomed diners such as rats. Jon Field, Senior Pest Control Operative at Stratford District Council says: “Rats are active all year round. However, they look for warmer environments with an easy food source when the temperature drops. At this time of year we are receiving dozens of calls every day from residents who have had rats in their homes or outbuildings and when we arrive most of these homes have a rodent buffet on offer in the garden. Residents are keen to help the bird population by leaving food out and this is to be encouraged but it must be done responsibly otherwise there is every chance that unwelcome guests will arrive as well. You can help yourself by ensuring that your doors and windows are in good repair, making it difficult for rats to gain access and making sure air bricks are intact. Remove any sources of material which will provide a shelter for rats such as piles of timber or garden debris. If you do feed the birds please do not overfeed and clear up uneaten food each night. For further information or advice on Stratford District Council’s Pest Control services please call 01789 260814. 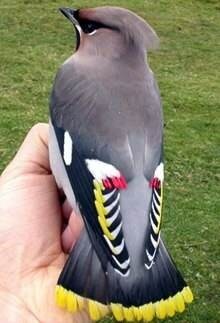 The bird illustrated is a Wax Wing. 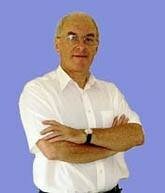 Paula Watson is our speaker on Tuesday March 2nd and her subject is “Health and Fitness for Adults”. Visitors are welcome to join us for this “Spring” subject! 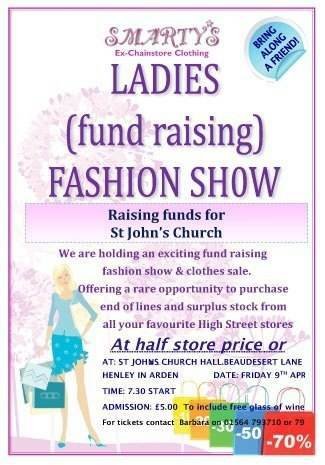 We meet in the Memorial hall from 7.30pm. Our next meeting is on Tuesday 9th March 7.30 pm in The Memorial Hall when our speaker is Mr Bob Harris National Demonstrator on “Seeds of Creation”. Competition “Square Deal”. Visitors welcome (£5). Our next meeting is on Thursday 18th March in the Baptist Church Hall. The AGM will be held at 7.30pm followed at 8.00pm by a talk on “The Restoration of Chedham’s Yard”. Visitors and new members are very welcome. Further details from Pat Kench on 795419. We will be travelling from “Southern Ireland to the Highlands” with Rosemary Morris on Tuesday March 16th and look forward to meeting any visitors from 7.45pm in the Baptist Church Hall. 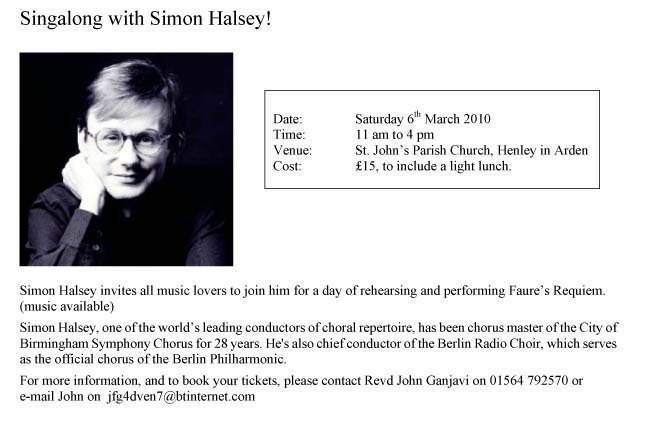 A concert in St John’s Church Henley on Sunday March 7th at 3.00pm.